Jason Castro had a breakout season for Houston at the plate in 2013, but the left-handed hitting catcher has settled more into a high-risk, high-reward mode since then. Jason Castro had a breakout season for Houston at the plate in 2013, posting an .835 OPS in nearly 500 plate appearances and landing on the All-Star team. Since then, the left-handed hitting catcher has settled more into a high-risk, high-reward mode at the plate: double-digit home runs each of the past three seasons, but triple-digit strikeouts and a low batting average (between .210 and .222 each of 2014-2016). But he’s a stalwart when it comes to pitch-framing metrics. And that — combined with at least a threat of getting ahold of one at the plate — has made him a coveted free agent this offseason. 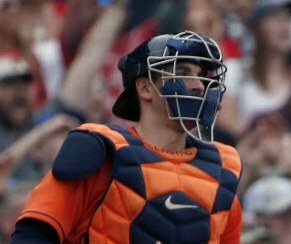 The Twins are among the teams aggressively digging into a very thin market of catchers, and may turn out to be a landing spot for Jason Castro, who is expected to get at least a three-year deal from some team. Castro excels at pitch-framing, and Derek Falvey, who heads the Twins’ baseball operations, just saw the impact of that as Roberto Perez steered the Indians’ pitching staff through the postseason. Indeed, Castro was fifth in the majors last season when it came to framing pitches for strikes. He was similarly good in 2015 and 2014. Last year he got 96 more strikes called than would have been expected. Primary Twins catcher Kurt Suzuki was a minus-38 in the same category last season, while Juan Centeno was a minus-127 (second-worst in the majors). John Ryan Murphy was about average (minus-1). Add those three up and you get minus-166. Castro was a plus-96 — in other words, 262 strikes better than those Twins catchers. If you don’t think that’s a big deal, consider these differences: after batters reached a 2-0 count against Twins pitchers, they had a .958 OPS. Switch a pitch to a strike and make the count 1-1, and suddenly batters had a .770 OPS after reaching that count. Better yet: batters had a .503 slugging percentage after getting to 3-1 against Twins pitchers. But after 2-2, again changing a ball to a strike, that slugging percentage went way down to .353. Even if it only amounts to a couple of stolen strikes per game, it can make a huge difference if it comes at the right time. We’ll have to see if the Twins’ pursuit of Castro is, indeed, as legitimate as Olney makes it sound. But it’s the kind of move that would make sense as Falvey tries to improve the pitching staff.